Spooky season is upon us, and with it come the costume parties, trick-or-treaters and an abundance of sugary sweets. While it may be all too easy to slip your hand into the candy bowl and eat those pumpkin-shaped chocolates while watching Hocus Pocus, you might want to think about how all that sugar affects your body. On average, a staggering 3 cups, or 7,000 calories worth of sugar is consumed per person on Halloween. That’s a whopping 46 times more than what is recommended for men and women on a daily basis. That much sugar doesn’t just put us at risk of gaining a few extra pounds; it also has some pretty serious health consequences, especially for seniors. One of the more obvious effects of too much sugar is something everyone notices first – our smiles (more specifically, our teeth.) Consumption of too much sugar gives bacteria that live on the surfaces of our teeth more food to consume. These bacteria, in turn, produce acids that erode our tooth enamel – something that can never be replaced. This leads to increased likelihood of cavities, tooth sensitivity, yellowing teeth and tooth loss. Seniors are especially prone to these effects, as the durability of our teeth lessens as we age. Keep your smile in mind the next time you reach for the candy bowl. Increased sugar intake can also cause high blood pressure and even heart disease. According to a CDC study, those with an increased sugar intake were 38 percent more likely to die of heart disease. High blood pressure can also complicate things, as the heart has to work harder to keep up with the rising pressure. Putting your heart under so much strain is never a good thing, especially when it already has enough to do by keeping you alive. Lastly, a recent Mayo Clinic study showed that sugar intake correlates directly to an increase in the likelihood of developing mild cognitive impairment, or MCI. What’s even more alarming, those diagnosed with MCI are even more likely to develop Alzheimer’s disease, which accounts for nearly 100,000 deaths per year in the United States alone. Worried yet? 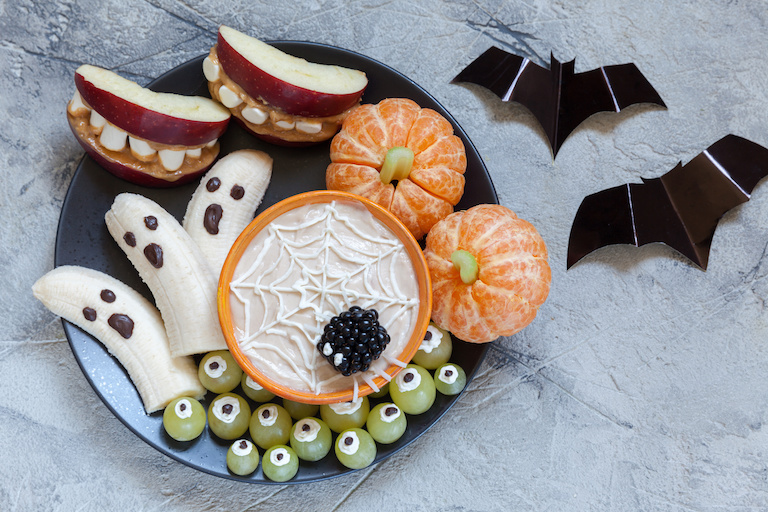 Fear not – there’s plenty of healthy snacking alternatives to enjoy with your Halloween festivities. Throw out the caramel and opt for chocolate covered apples, which provides an anti-oxidant rich snack that tastes great, and still gives you the chocolate fix you’re craving. Keep the fruit trend going with these adorable peel-and-pop pumpkins and entertain guests with your creativity. And put the butter and heavy amounts of salt aside for this lime and parmesan popcorn that’s sure to be a hit at your party while keeping calories low and sugar out of the equation! Halloween can be a scary time of the year, but thankfully, your health has less to worry about if you branch out and find creative ways to enjoy the holiday while being conscious about your snacking. Check out loads of healthy Halloween alternatives on Pinterest or any other cooking website today!